Miss a message and need to stream or download it? Want quick access to current Hillside Bible events? Need a fast and convenient way to give online? 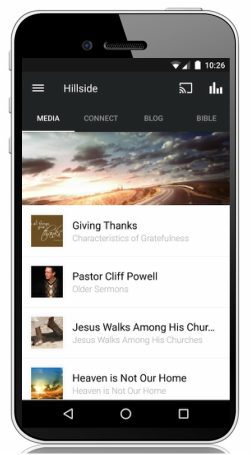 The Hillside Bible App offers these features and more, allowing content to be easily shared through email and social media routes like Facebook. Download it today and let's live the life together! ATTENTION iPad, Android Tablet, Windows Phone, Amazon Fire users! Our App is now live on all platforms. The new Hillside Bible mobile app has officially launched and is now available for downloaded. So we asked ourselves, why would anyone want to download it to their phone? We wanted to take a few seconds to share three reasons why you might be interested in downloading it. We wanted to create a one-stop-shop kind of app that allows you to listen to or watch the latest messages, access all of our blogs posts, read the Bible (with a great reading plan), volunteer to serve, and sign up for events — so we did just that! Now all you need is one app to receive all of Hillside Bible's content without having to search for it through multiple platforms. Now that so many people in our culture are reliant on their mobile phones, releasing an app like this for absolutely free can be a great way to reach previously unreached people. Just think about it: you’re talking to your tech savvy, atheist, colleague at a staff party and you tell them they can check out your church’s new app for free and, on top of that, it doesn’t have cheesy content and it isn’t poorly designed. In other words, it’s a simple, compelling, way to share an engaging and practical tool with someone you might be having a hard time sharing the gospel with. Many of us spend a significant portion of our weekdays commuting to work, and if we have kids, driving them to and from school and after school activities. Did you ever stop and ask yourself if there’s something better to listen to than FM radio while you’re in transit? Well, now there is. You can redeem your commute by taking our app in the car and listening to messages as you travel to work in the morning and shuttle your kids to practices and dance classes in the evening. So what are you waiting for? Download the new Hillside Bible app here or click the images below. Then spread the good news!